Up and down winds at Pismo while locations nearby rip! So what does all that jargon mean? First look at the wind graph inset into the graphic above. 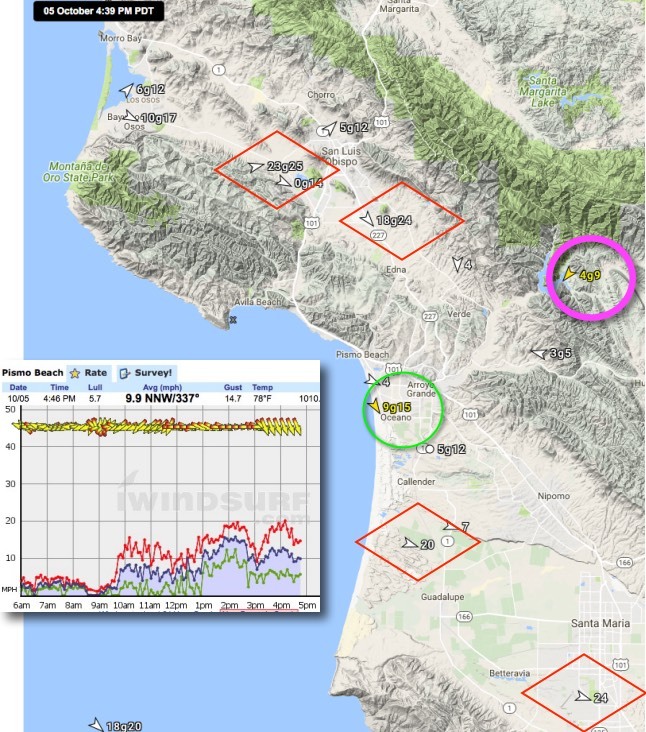 Notice that from 1 PM to about 2:30PM the winds at the Pismo sensor (green circle) did reach the forecast values and were pretty up and down as forecast. But why did they fade so fast by 3PM and why up and down? And why were the WNW winds so powerful at the nearby Red Diamonds? The local cause is the weak NE winds you see in the purple circle in the top imagery. But the large scale answer starts far away from Pismo. Today there is high pressure in the Great Basin. That is creating NE weak offshore winds for much of California today. Those winds were funneled over the coast range and reached very close to Pismo. You can see this is the animation above. Look from the upper right corner to Pismo and you can see the NE wind flow at 2PM. Meanwhile as the pressure gradient to towards Cuyama Valley & Los Olives picked up in the afternoon the North Pacific High’s surface NW winds started curving in towards Pismo which you can see in the right side of the animation. Now look that the area where the text says “Wind battle zone” In this area the WNW ocean winds and the NE winds from the interior collided. This NE flow tends to delay the arrival of the ocean wind and when there is a NE gust the winds ocean winds are blown away from shore so you experience a lull. But when there is a lull in the NE winds the WNW ocean winds slam back to shore and you experience a strong period. Trying to put all this into a forecast is impossible hence all the weasel words in my brief forecast this morning.